This modest announcement aroused great interest among Glasgow and Clydesdale yachtsmen, and at the first meeting, held at the Globe Hotel, Glasgow, about thirty gentlemen attended, and the club was formed.The first regatta of the Clyde Model Club took place on July 17, 1857, at Largs. In the early part of that year the Lords of the Admiralty had given permission to the club to fly the blue ensign, with their burgee, the device, a lion rampant on a yellow shield, being upon a blue ground. Among the original members were the Hon. G. F. Boyle (afterwards fifth Earl of Glasgow), Mr. James Grant, Mr. H. B. Stewart, Mr. Robert Hart, Mr. Daniel Buchanan, Mr. Thomas Falconer, Mr. James Rowan, Mr. Robert McIntosh, Mr. Robert Sharp, Mr. Peter Walker, Sir John Ure, and Mr. John Ferguson.Early in the career of the Clyde Model it was found that even success and popularity had their drawbacks, and the price which was paid for the flattering success of this organization was the impossibility of keeping it going after the first few years on the narrow lines originally laid down. The classification for boats was there­fore extended, and in 1863 races were given for 10-tonners and 25-tonners, and from this point restrictions as to tonnage gradually disappeared. One effect of this expansion was to make the title of the club, which had been so appropriate at first, a complete misnomer, and it was changed to the Clyde Yacht Club. 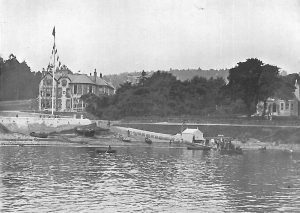 In 1871 the club was granted permission to call itself the Royal Clyde Yacht Club. Some time prior to this date the club fixed upon Hunter’s Quay as its rendezvous for regattas. In the same year as the club received permission to use the prefix ‘Royal,’ it attained to the dignity of having a home of its own. 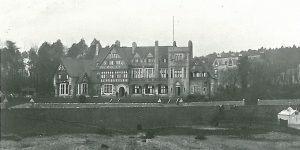 The club-house, which stood on the site occupied by the present one, was destroyed by fire in the middle of the summer of 1888. It was replaced as quickly as possible, and the new house, one of the best examples, on a considerable scale, of the half-timber style of architecture in Scotland, was designed by Mr. T. L. Watson, a cousin of the late famous naval architect. The Royal Clyde has always been fortunate in its flag-officers. Mr. Smith, the first Commodore, was a veteran yachtsman when the club was founded, and after serving it most loyally for four years after its establishment he expressed a wish to retire. He took a farewell of the members at a big dinner which had been organized in his honour at Glasgow. At this dinner Mr. Smith was the recipient of a valuable clock as a mark of the esteem and affection the members held for him. The Commodores since that time have been the (fifth) Earl of Glasgow ; Mr. John Clark, of Curling Hall, Largs; Mr. John Scott, C.B., Largs, and Sir Hugh Houston Smiley, Bart.